On July 7, 2017, the Centers for Medicare and Medicaid Services (CMS) issued revisions to its Civil Money Penalty (CMP) policies and CMP Analytic Tool to increase national consistency amongst Regional Offices (ROs) when imposing CMPs as a result of the survey and certification process. The revised CMP Analytic Tool became effective on July 17, 2017. This is an important document, as CMPs have been more broadly imposed at greater amounts as a result of survey deficiencies and a change in federal law indexing CMPs to inflation. 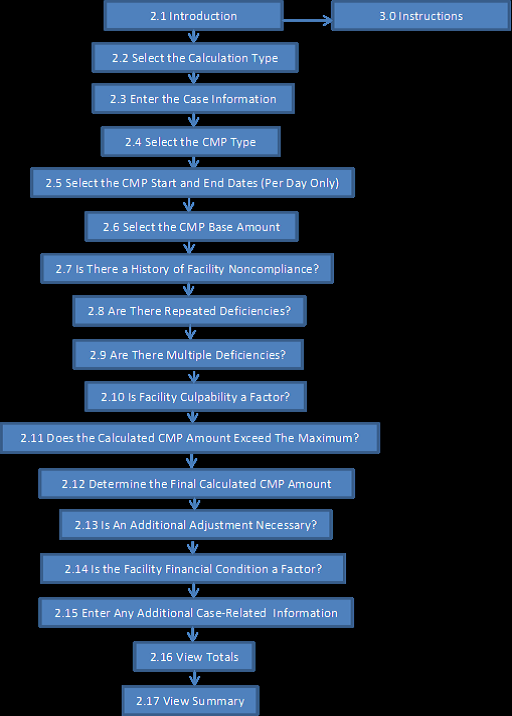 A complete copy of CMS's Memorandum on Revision of CMP Policies and CMP Analytic Tool can be found at here, and additional information on CMP amounts and ranges can be found in 42 CPR 488.408 and on the CMS website. (Note: this new tool does not address noncompliance at level 2, S/S of "D" or "E." The RO may impose CMPs for level 2 deficiencies and will make this determination based on the factors set forth in 4 CFR 488.404). Per Instance CMPs will be imposed for past noncompliance that has since been fully addressed and the facility is back in compliance at the time of the survey. Per Instance CMPs will also be imposed for noncompliance that existed before the survey and still exist at the time of the survey. ROs are instructed to impose Per Instance CMPs retroactively for this type of noncompliance. There is an exception, however, as Per Day CMPs will be imposed for past non-compliance where (1) a resident suffers actual serious harm at the immediate jeopardy level; (2) a resident was abused; or (3) the facility had persistent deficient practices violating federal regulations. Per Day CMPs are the default for noncompliance existing during the survey and beyond. There is an exception, however, that allows for Per Instance CMPs for facilities with good compliance histories and where a single isolated incident causes harm to a resident unless abuse is cited. Factors considered when determining a "good compliance history," include: the facility is not a Special Focus Facility; the facility has not had a finding at a S/S of "G" or above in the past three calendar years unless they were cited as past noncompliance; the facility has a history/pattern of achieving compliance prior to or at the time of the first visit; and/or the facility has a history/pattern of sustaining compliance with previously cited deficiencies (i.e., no repeated deficiencies). CMS ROs are now to consider the timing of the revisit where compliance is certified when imposing the final CMP amount. CMPs of $250,000 or more will be reviewed by the CMS Central Office. The instructions for the CMP Analytic Tool provide several valuable takeaways for facilities. ROs are now instructed to use a separate calculation for each Life Safety Code (LSC) CMP, Health Survey CMP, or any new or changed CMP within a noncompliance cycle. Factors that result in an increase in the CMP such as culpability and facility history of noncompliance, however, are only to be calculated one time for each survey. It is important to understand, however, that under the CMS State Operations Manual, due to the timing and proximity of an annual Health and LSC survey in relation to each other, the two surveys and may be part of the same 180 survey cycle. Thus, it is possible that there could be two CMPs arising from each of the Health and LSC surveys during one survey cycle. Timing of Per Day CMPs is also addressed. Per Day CMPs now begin on the first day that noncompliance at the cited scope and severity level is documented, or on the first day of the survey that noncompliance was identified. This date may precede the first day of the current survey unless the facility can demonstrate that it corrected the noncompliance prior to the current survey. While a facility's financial condition can be a factor supporting the reduction of the CMP, the facility is responsible for notifying CMS of hardship and providing financial documentation. Timely and complete submission of such financial information is essential. The facility met mandatory reporting requirements. We do note that we have rarely seen skilled nursing facilities qualify for this 50 percent reduction. In summary, CMPs have been more frequent and can be imposed at extremely large amounts. The new CMS CMP guidance does not eliminate the risks and impact, but is a partial step in the right direction. If you have questions on these or other issues regarding CMS or CMPs, please contact Howard Sollins, Quinn Carlson or a member of our Long Term Care Team.